Bourj El-Barajneh refugee camp has been established in 1955l. The living condition of many life-long refugees in the refugee camp are horrible. Name Bourj El-Barajneh. Palestinian refugee camp, Beirut. Aim To help Palestinian refugees pay their medication and hospital bills. People reached There live about 20,000 people in the camp. My visit to the Bourj El-Barajneh refugee camp was unforgettable. I had tried to get in touch with the refugees through Hezbollah, and visited their media relations office. They let me fill out a form but - of course - never got back to me. An unbelievable chain of coincidences led me to the Bourj El-Barajneh camp which I found out was nearby. Someone spoke English and showed me the way. At the camp entrance they were reluctant at first, since Hezbollah does not allow journalists to take a look around. But there was a German speaking man in the small telephone shop, and we had a chat about Berlin. He introduced me to Adel, a very good man who showed me around the camp and explained everything in English. He lives in the camp with his seven children. The camp has been established in 1955. There live about 20000 people there, under very bad conditions. The streets are so narrow that the children have no playground. Electricity wires and water hoses are bound together and hang above the streets. This is dangerous. Last year, three young men have died because of electric shock. Many houses are never repaired after the Israeli bombs struck them in 2007. At night, I see a lot of rats in the streets. Adel then takes me to the families I am supporting. Six years ago, Chaldia Akar became a widow. Her family fled Palestine in 1948 and the first decade in exile they lived in a tent near Baalbek. 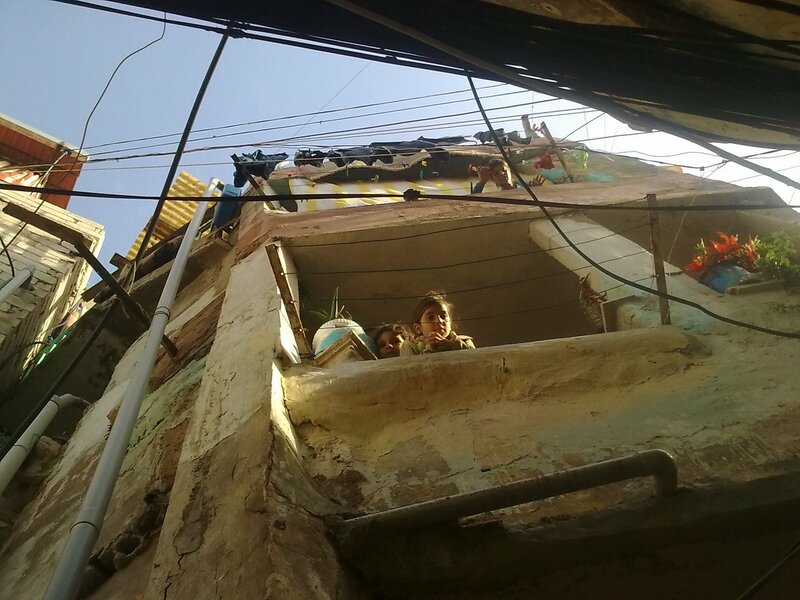 Later they moved to the Bourj El-Barajneh camp. She lives with her sons in a humble house. One son is not at home. He has been arrested by the Lebanese army because he was at the wrong place at the wrong time. They expect him to be released soon. But there is no certainty. The medicine she needs costs about fifty dollars a month, and that will be my donation to her. Chaldia's sister Hedija and her daughter Sana both suffer from a cornea disease as a result of the violence. Their house has been struck by a bombshell during the latest war. They need medicine. I ask her to tell about her family. Her husband and sons had died. One son was only 14 when he played too close to a bomb. That bomb went off and killed the boy in 1988. Her husband had died just before the war in 2006. Their medication doesn't cost much. 29$ covers a month for both of them. I decide to give them 50$ to do something about the leaking roof or the bathroom door. In 1995, Ibrahim had a car accident on his way to work. He was educated as a welder. He has been confined to his bed ever since. His brother takes care of him. One year ago, they diagnosed throat cancer and he needs medical treatment. The camp hospital is not equipped for this so they are collecting money from the community. I don't want to make this beautiful solidarity meaningless by donating the whole amount needed myself, but on the other hand I want to make sure Ibrahim will be treated. So I ask if 100$ would be helpful, and hand over the money. Adel writes on it that it is for Ibrahim's hospital bill, and keeps it in a safe place. Then an idea comes to my mind. I could show a movie here with my pocket projector, in Ibrahims room, and invite the children. Ibrahim is lonely and will like it. The children always enjoy the kind of movie I am showing. And maybe they will contribute for Ibrahims hospital bill. The movie is "ice age 3" by the way. And so we pull it off. There are a four children and they do enjoy it, even though after half an hour we have to stop since Ibrahim got tired. They offer me to spend the night there, an offer that I gladly accept. Being here is so much better than living in anonymous hostel rooms. I am so grateful that this worked out well. The people in the camp are most friendly. If you are gonna tell me you don't have the money to do something like this, also tell me how high your hotel bill is. Ask any taxi driver for Bourj El-Barajneh and they will welcome you there, even let you stay for the night. You will have an unforgettable experience, and our friends that are forced to live in such miserable conditions, are helped a lot, even with fifty dollar. Go!